After many years, wall coverings are in again. And yet in Southern New Jersey, wallpaper is still more often removed than installed (with the exception of historic areas such as Cape May). It's probably because most NJ homeowners have a love/hate relationship with it: it's a great way to change the mood and style of any room, but a hassle to install and a real pain to remove. what do you do with it and how can you get rid of it? When possible (if the walls are made of plaster or wood), it's always best to start with a clean slate - both for re-papering and painting. Removing all the layers of old wallcovering ensures that you won't get such unexpected surprises as bubbles, peeling or color bleeding in your new paint/paper job. And of course, it will usually look better and last much longer. Flocked and textured wallpapers in good condition could look interesting painted if they didn't have the problem of the seams (spackling would ruin the pattern). 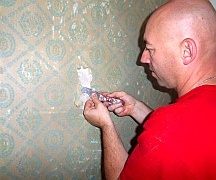 But while some wallpapers are easily strippable, others require a lot of elbow greese, time, patience and skill to strip without damaging the wall underneath. 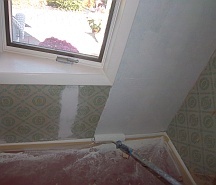 When properly installed, vinyl and reinforced wallpapers usually come off in sheets when pulled at a corner. These are a dream to work with, but with dozens of New Jersey wallpaper removal projects under our belt, we know that unfortunately this perfect combination of material and application doesn't happen too often. Usually it's necessary to wet the paper to dissolve the paste, and then use a broad knife to scrape it off. If water alone is not enough, special wallpaper removers with enzymes can help break down the adhesive. And if the wallpaper is still not budging, it's time to take out a steamer. Some papers do not respond to water soaking, but vapor will penetrate where water cannot. 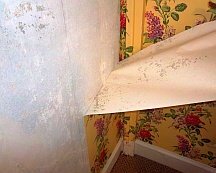 It's best to first score the surface with a wallpaper tiger before wetting or steaming (to help the moisture get in) and remove the wall covering one layer at a time (to avoid digging too deep into the wall). 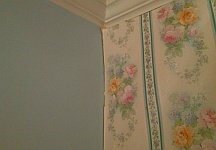 And if the original layer cannot be removed without damaging the wall, it's better to stop at that layer and then proceed as you would with painting wallpaper (see below). But not all wallcoverings can be removed effectively: no matter how much you wet or steam them, some papers come off in tiny pieces, so you can only strip literally one inch at a time. 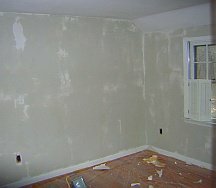 In such cases, instead of wasting resources and risking damaging the wall by all that incessant moisture and scraping, it makes more sense to just paint the old covering. Besides, there are situations when wallpaper should always be painted over if it can't be stripped dry. 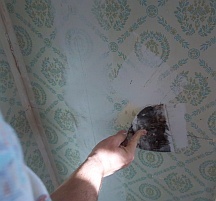 When painting wallpaper, the job is only as solid as the paper's adhesion to the wall. That's why it's crucial that the wallcovering is firmly glued to the walls, and is as smooth as possible. The first step is to tear away loosened strips of paper and feather edges and seams. Next, all the wall imperfections are spackled and gaps caulked, just like for regular painting. After the repaired areas are dry and sanded smooth, a coat of oil-based primer is applied to seal the walls before painting (without this step, the water in water-based paints and primers can loosen the old paper layers and cause them to pull away from the wall). The walls now look like wallpaper never happened, and it's finally time for the fun part of the project - choosing colors and painting... or papering again! Apply, Repair, Paint or Remove Popcorn Ceiling?